Internet computing has already developed into a vast area that no one individual can hope to understand fully. However, because of its obvious practical importance, many people need to understand enough of Internet computing to be able to function effectively in their work. This need is not addressed by any existing source. Typical books and articles concentrate on narrow topics. Existing sources have the following limitations. Those targeted at practitioners tend to discuss specific tools or protocols but lack a discussion of the concepts and how they relate to the subject broadly. Those targeted at managers are frequently superficial or concentrated on vendor jargon. Those targeted at students cover distinct disciplines corresponding to college courses, but sidestep much of current practice. There is no overarching vision that extends across multiple books. Those targeted at researchers are of necessity deep in their specialties, but provide only a limited coverage of real-world applications and of other topics of Internet computing. 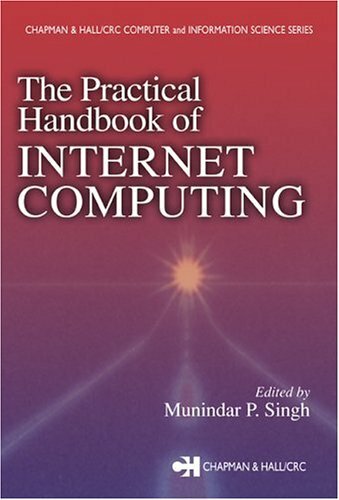 For this reason, this handbook was designed to collect definitive knowledge about all major aspects of Internet computing in one place. The topics covered range from important components of current practice to key concepts to major trends. The handbook is an ideal comprehensive reference for each of the above types of reader. An exhaustive coverage of the key topics in Internet computing. Accessible, self-contained, yet definitive presentations on each topic, emphasizing the concepts behind the jargon. Authored by the world's leading experts. Practitioners who need to learn the key concepts involved in developing and deploying Internet computing applications and systems. This happens often when a project calls for some unfamiliar techniques. Technical managers who need quick, high-level, but definitive descriptions of a large number of applications and technologies, so as to be able to conceive applications and architectures for their own special business needs and to evaluate technical alternatives. Students who need accurate introductions to important topics that would otherwise fall between the cracks in their course-work, and which might be needed for projects, research, or general interest. Researchers who need a definitive guide to an unfamiliar area, e.g., to see if the area addresses some of their problems or even to review a scientific paper or proposal that impinges on an area outside their specialty. © 2004. Munindar P. Singh. All Rights Reserved.